Tomi Ogundayo is from New York City but she lives in Barcelona. 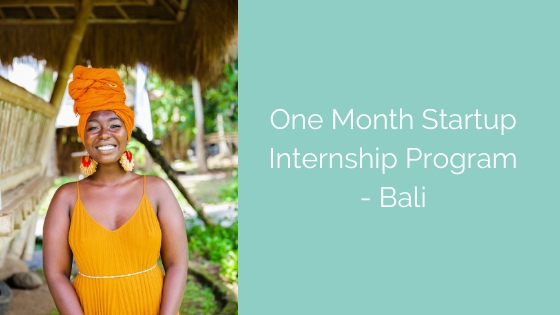 She spent one month in Bali interning for a Singapore-run blockchain startup. I was actually looking for an internship in Spain when I found Start Me Up. I’m teaching English at the moment but I’m very into social justice and impact and I wanted to explore the world of tech. In Bali, I worked on an early stage blockchain project. My mentor was in Singapore. She’s a business consultant focusing on blockchain and blockchain startups. Even though most of my work is done remotely, we communicated nearly every day. I was compiling research about different coins that were available. Then I focused specifically on social impact coins that help with things like proper supply management. I’m interested in finding ways to hold business accountable for the pollution they create, so this was ideal. My project taught me a new element of social justice, which was super cool. This experience gave me a whole new way of looking at technology. Instead of it just being used for financial means, blockchain technology can help with things like giving identity to people, it can also be used to generate credit scores and even to track diamonds to ensure there’s no exploitation across the supply chain. It’s hard to describe the co-working space. Every day I would sit in one corner of a gigantic table. I would get to know people from different parts of the world. I met people from everywhere from Spain to Singapore and I’ve done a lot here that I wouldn’t do at home. Growing up in NYC, I’m used to being sequestered in buildings. Here I can spend seven uninterrupted hours in nature. This experience is great for young people. Most of us are trapped in the idea that you have to get a 9 to 5, complete a checklist of things, get a pension and then die. Being here no matter what age, there will be something for you.